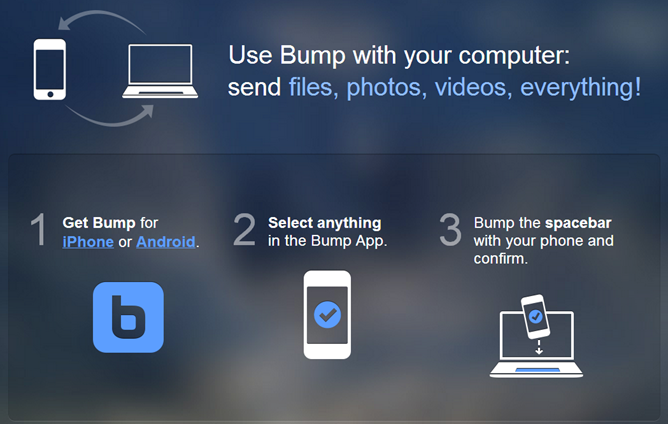 When Bump showed up on the smartphone scene, it was something of a novelty, but at the time it delivered file sync and transfer faster and easier than anything else. But with the proliferation of Dropbox, Google Drive and innumerable others, the game has changed. Bump plays a bit of catch-up today with an updated Android and web app, which allows users to send files between PCs (web) and mobile devices with ease. It's not the most secure or natural movement, but as long as both devices have a stable Internet connection, it's incredibly fast - you don't need to log into anything, on the app or the website, and verification is a single button. Sending files from your computer to your phone is almost as easy, once you've connected them. Just click the "send files to your device" link in the corner. The convenience factor makes it compelling - this might just beat out Airdroid as my go-to app for quick uploads and downloads.